Guest post by Simon Underdown. My wife and I moved to Tongwynlais just over three and a half years ago, my wife is originally from Fairwater and I was born in Barry. We often cycled through the village on our way up and down the Taff Trail and loved the row of cottages at the top end of the village and are now very happy owners of one of them. 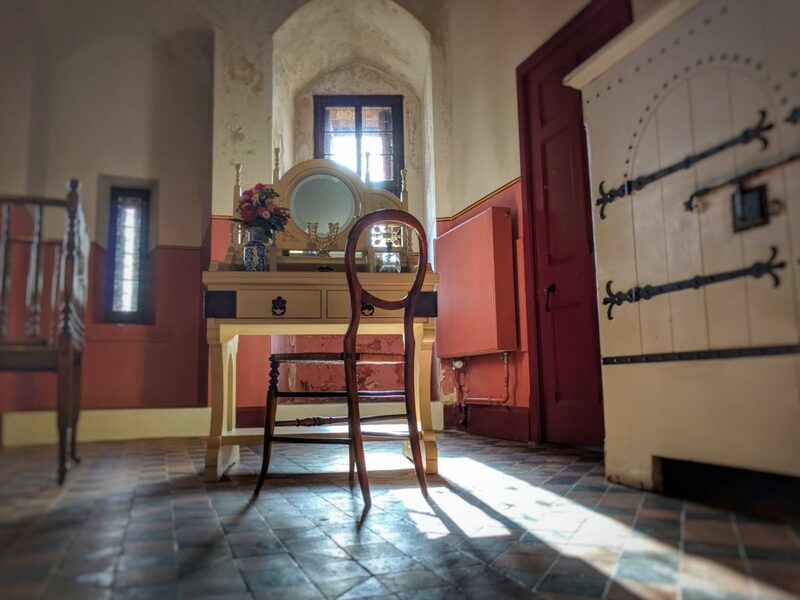 Since moving in we have spent the time redesigning the garden and have just finished a building project to renovate our kitchen, dining room and bathroom. We now enjoy village life having met many of the locals and even have a favourite table in the Lewis Arms! You can often see me walking my Collie dog through the village of a morning. 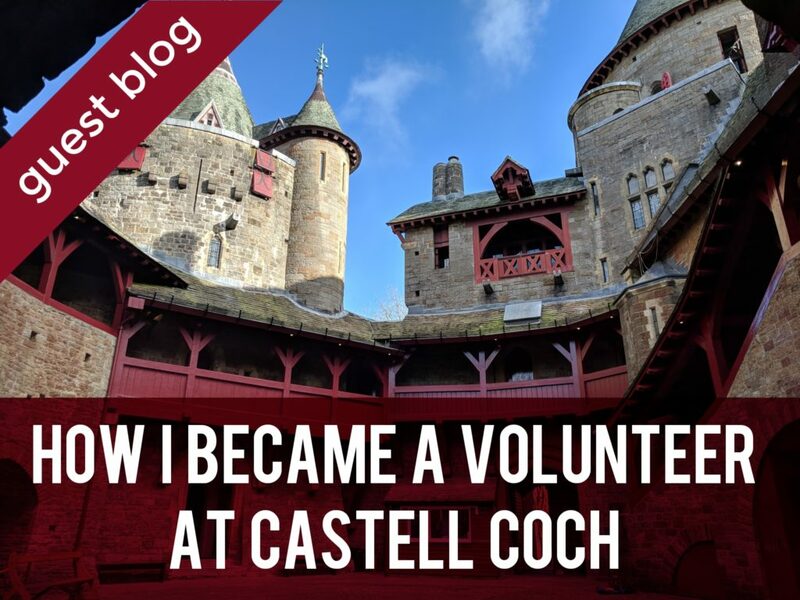 As I was fortunate enough to retire early I now find myself with a lot of time on my hands and last spring read the Cadw advert for volunteers at Castell Coch, after quite a lengthy application and vetting process I started as a room steward last September. I’m usually there Monday and Tuesday normally from 10:30 to 2:30 although this can vary. I have also helped out when schools visit or there is a wedding. The weddings are special to us as we were married there a year last May. In December I was lucky enough to meet Prince Charles when he visited and had a cup of tea and cake with him. I was also an elf helping Father Christmas give out presents to children just before Christmas! My duties as a room steward mainly cover the rooms in the Keep Tower. I’m there to answer questions visitors may have and I have met people from all over the world. I also have to keep an eye on the rooms as, believe it or not, some items have been stolen over the years! 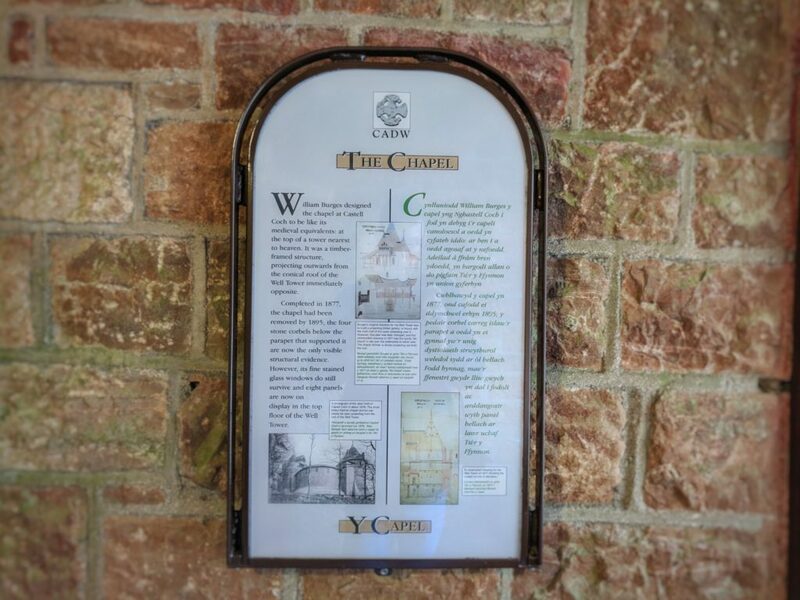 I have spent time since starting “swatting up” on the history of the building from its origins in the 12th century as a motte-and-bailey through its sacking by local Welsh Kings, to the renovation by the Marquess of Bute and to the present day. There is a lot to know as Bute and his architect William Burges had many interests including Gothic architecture, the natural world, spiritualism and the medieval period. There are many hidden meanings within the sculptures and wall paintings that a lot of visitors just pass by. The small team of full time custodians are a friendly bunch who have made me feel welcome and helped me improve my knowledge of the place. Cadw have had a volunteering program running in North Wales for some time and are only just rolling it out in the South so are still looking for people to apply. The hours are totally flexible and I have found the time spent there very rewarding, so if anyone reading this likes the idea you can either ask at the ticket office or go to the website. The new Cadw “Monument Pass” allows unlimited access to any one of Cadw’s monuments for just £6 per person. Local resident pass holders can exchange their existing pass for a new monument pass at most paid staffed Cadw sites. If I’m on duty that day I will be happy to answer your questions and I recommend the tea and cake on sale in the tea room!